Instead of downtown Anchorage, we spent the day out on the city trail. Becky's company is a major race sponsor and they throw a large picnic along the trail, and anybody is welcome. I got drafted to hand out hot sausage sandwiches to the mushers as they passed, something Becky's company does every year. 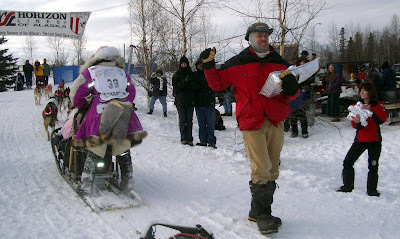 Here's me with a pan of sandwiches, that's #39 - the legendary Dee Dee Jonrowe - on her way past, and that's Becky on the right bringing me more sandwiches - with 98 teams, two mushers and at least one passenger per team, we handed out a lot of sandwiches (Dee Dee, incidentally passed on the sandwich, about half do). Eventually my arm went numb, so I drafted every kid in sight and had them pass the food off to the mushers. I'm tired, and cold, and stiff and sore. And there's more tomorrow. So, I'm going to sit on the couch and watch Secondhand Lions, then I'm going to bed. 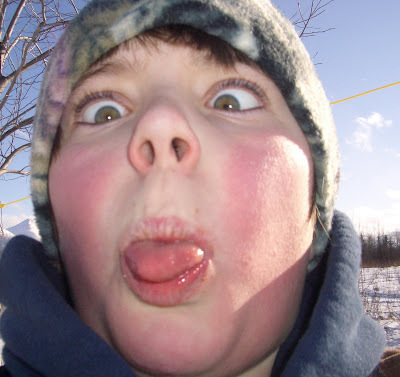 Oh yeah, one more thing - don't give your camera to your eleven-year old, or you'll end up with pictures like this on your memory chip. Just saying. He's the computer guy in a 3-ish person company, and has the sole responsibility of GPS tracking, web updating, server load balancing, etc. If you want to follow the racers in near real time, just go to www.iditarod.com and click on "Live GPS Musher Tracking." I love how the pictures of you in that hat and jacket keep ending up immediately to th left of...the picture of you in that hat and jacket. 3-ish person company is a really good name for a marching band. Hmm... that hat's starting to look kind of faded. Don't talk about the hat, MWT. Off to the restart, back much, much later. Hey! Look! More green eyes! Yay, 11 year olds. Because they make us laugh, and remind us why we bother.